Our services are very inexpensive, we offer $15.00 to $25.00 a visit (up to two pet(s) these prices depend upon the area that you live in. this service includes walking, feeding and playing with your pet(s)...animals get lonely too! So, if you are at work, laid-up or out of town on business or vacationing. We will provide the attention and care that you (the owner) would give your 4 legged friend(s) in the comfort of your own home. You can put your mind to rest while your at work out of town or on vacation and now can concentrate on your job or vacation knowing your pet(s) are being well taken care of. * For Dogs and Puppies-$15.00 to $25.00 a visit, includes walking, feeding and playing with him or her. * For Cats and Kittens-and other small animals-$15.00 to $25.00 a visit, includes feeding, cleaning the litter box or cage and playing with him or her. * "PLEASE" mention these services when booking so, we can schedule them in our visits to your home. 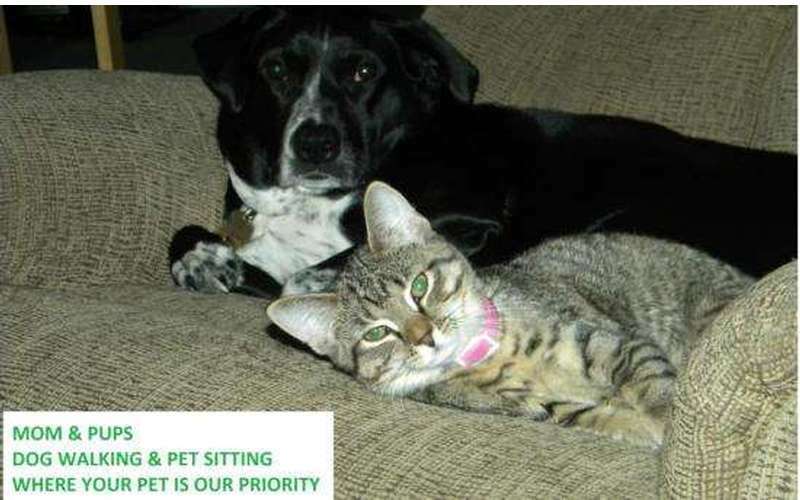 * To get this pet walking/pet sitting services here are some easy steps. 2. Schedule an appointment with us to meet you and your pet(s). 3. Mention any extra services you like us to do or coupons you would like to use. 4. Book your date(s) and time(s) you would like us for services. 5. We will go over the particulars about what we do and answer any questions you may have. 6. "ENJOY" your vacation or concentrate on your work at your office or away.
" We offer gift certificates and coupons"...(see coupons). "THANK YOU"
for choosing Mom & Pups Where your pet is your Priority! * We are fully insured. Andrea was great with our cat and very thorough. She followed through on all of our requests and left us detailed notes. It is obvious how much she cares about animals and loves her job. I wouldn't hesitate to recommend her. Andrea is clearly a very caring person who really enjoys and is great with animals. She did a vacation sit for my cats, and it sounds like things went really well!